Most Australian cities are already located along coastlines or within river catchments. Whether or not we are able to keep global warming below 1.5°C, the majority of the Australian population will soon live in a flood zone. This means we will have to start planning and designing our cities for a new normal. We will become used to redesigned parks and gardens, for instance, that help us co-exist with water. Understanding the water cycle is an opportunity to generate a positive relationship between natural processes, plants and people. We can learn to look at flooding as a regenerative element to improve life in urban areas. For a long time, however, urban design has overlooked the opportunity rainwater provides within the urban system. A conceptual leap forward is needed to shift the common perception of rain as waste to be disposed of. It can instead be seen as a non-renewable resource to be protected and reused. This change is already visible in front-line urban experimentation. Cities like New York, New Orleans and Copenhagen are reorganising themselves following catastrophic floods in recent years. Here, urban design is changing radically the ways to use, experience and perceive cities' space. Innovative strategies understand flood as a natural process to work with, rather than resist. Non-structural, soft and nature-based solutions to flood adaptation are replacing centralised and engineered technologies. These projects use climate change positively to provide multiple added benefits. The benefits include spaces for recreation, ecological functions, environmental recovery, increased urban biodiversity and economic regeneration. The idea to work with water through flood-mitigation measures based on natural processes has been explored in different ways. These can be summarised in four main strategies. Sponge spaces and safe failure: a network of small-to-medium-sized green areas absorbs and stores excess water. Almost every urban open space, including rooftops, can be part of a decentralised off-grid system. 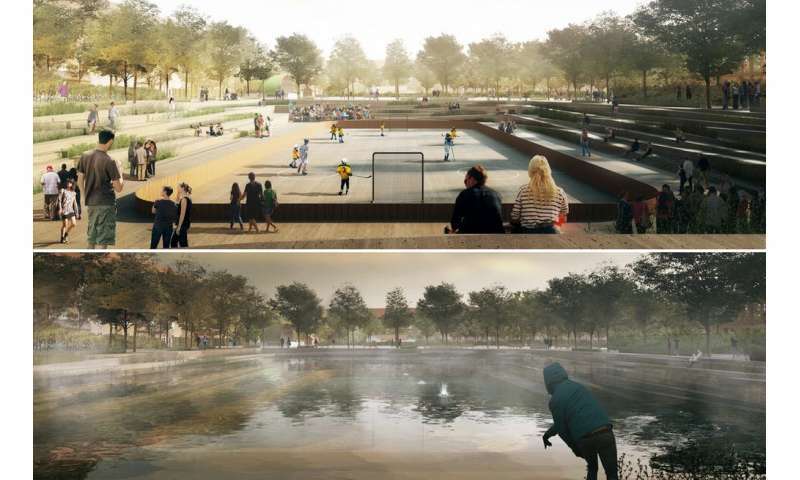 In Copenhagen, the Climate-Resilient Neighbourhood program aims to transform at least 20% of public ground to work as a sponge to reduce flash flooding in dense inner-urban areas. When needed, controlled flooding of one part of the system will avoid problems elsewhere – such as roads. These "safe to fail" spaces can have multiple functions and be used for public recreation when they are not flooded. 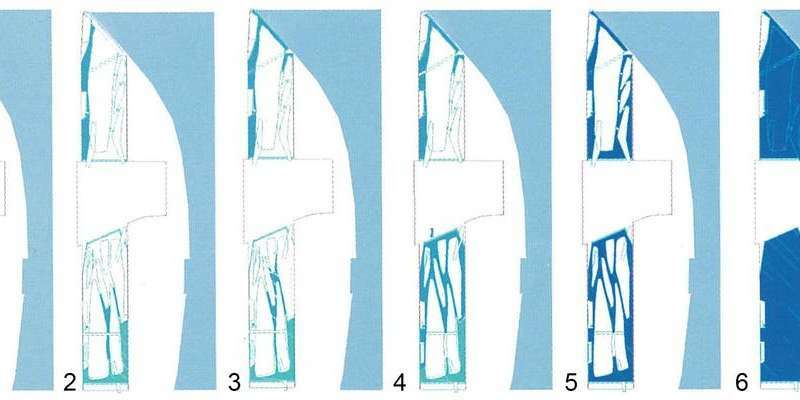 Design for variability: as water processes are seasonal, design should reflect variability and periodic flood change. A more comprehensive understanding of nature's processes in cities is emerging as a source of design inspiration, leading to a new spatial expression, besides ecological benefits. This is an interesting advancement in urban design, with evolving layouts replacing fixed forms. A focused selection of plant varieties and soil substrata supports spatial variability. 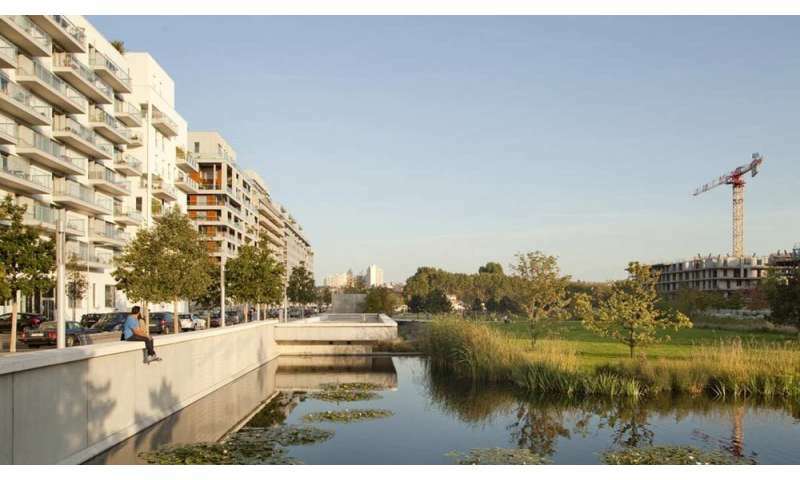 A good example is Billancourt Park in France, where water defines the constantly changing spaces of the gardens. Don't let it go: rainwater is a precious resource and should be retained and used on the spot. Impermeable ground and roof surfaces should be harnessed to capture rainwater, harvest it and store it for further uses, such as irrigation, washing and flushing toilets. The process is particularly simple and does not require specific technology, especially for rooftop water, which is clean enough to be reused as it falls. Let it seep through: paving should let water infiltrate to the underground and feed the aquifers. Permeable grounds restore the natural water cycle, allowing humidity exchange between air and the soil. An additional benefit is that this cools urban spaces, reducing heat in summer and creating a more comfortable habitat. To limit the number of impervious surfaces, roads and parking should be reduced, with grass or porous tiles replacing asphalt. When paving is necessary, it should be designed to provide a moderate filtering function to reduce rain impurities. Broad implementation of the strategies needed to reduce flooding across public and private domains is complex. It calls for a collective effort. Research on urban climate adaptation suggests that planning for flood management is often a top-down process. Post-flood recovery programs have rarely been opportunities for central governments to consider the needs of local communities. Shared decisions on water management are needed to develop resilient communities and help them adapt to rapidly changing climate. New challenges can become opportunities if environmental goals can be twinned with sustainability and social equity objectives. Moreover, the implementation of flood adaptation measures is still too sporadic. It's often limited to centralised wetlands in large parks and gardens. A capillary-type network is needed, which infiltrates the dense urban fabric with small to medium nature-based measures. There is no evidence yet, however, that the cumulative benefits from these systems will be effective to avoid massive flash flooding. Therefore, the need to start systematically testing and monitoring these measures at the urban scale is urgent. We need to start asking questions such as: what if every roof had a vegetated surface, if every sidewalk had retaining capacity, if every parking space was a rain garden? Looking at how cities are designed and performing in Australia, there is plenty to learn from the international experience. We have a lot to do to adjust this knowledge to the local context. And we urgently need to apply this knowledge, because if we don't quickly learn how to work with water in cities, water will hit them even harder in the future.